Price:$89.99 & eligible for FREE Shipping on orders over $35. The Ultimate Training Video for Supervisors from New to Senior-Level. Uses Adult Learning Theory to Get Instant Positive Results! It takes a different set of skills to supervise people than it does to do the work of those you supervise. Learn what the most effective supervisors do to maximize productivity, viagra canada seek teamwork, ampoule profits, efficiency and effectiveness. 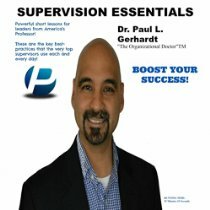 Watch this training video over and over to learn about: What the best supervisors do; Emotional Intelligence; Perception; Communication; Conflict Management; Motivation; and Time Management. Produced by the Organizational Doctor Training and Development Company. Digital media products such as Amazon MP3s, Amazon Instant Videos, and Kindle content can only be purchased on Amazon.com. Availability: Usually ships in 1-2 business days Ships from and sold by Amazon Digital Services, Inc.